Brookhaven of East Cobb in Kennesaw, Georgia is a serene active adult community designed by Jim Chapman Communities. With just 98 attached homes, Brookhaven of East Cobb offers a tranquil setting for 55+ homeowners where they can enjoy a maintenance-free living among a small group of neighbors and friends. The Brookhaven Clubhouse is 2,400 square feet and provides a great place for residents to gather and mingle for social events, parties, or meetings. Homeowners can convene in the multi-purpose room and catch up on current events over a cup of coffee or play a game in the card room. They can also utilize the catering kitchen to make snacks for club meetings or parties. For those who want to stay active and fit, they can head over to the exercise room to use the cardiovascular and weight-training machines. There is also a heated outdoor pool and patio with a fireplace where residents can swim a few laps or hang out by the pool deck. Jim Chapman Communities built these attached homes from 2008 to 2014 and are available on a resale-only basis. There are 98 attached homes arranged in quadruplexes that range from 1,626 to 2,375 square feet. Each unit includes two or three bedrooms, two to three bathrooms, and an attached two-car garage. These homes also feature an all-brick and stone construction, a finished or unfinished bonus room upstairs, vaulted ceilings, sunrooms, and covered patios or screened porches. Residents are sure to love living in a maintenance-free community because they will have more time to do fun activities instead of exterior home maintenance. The professionally managed homeowners association (HOA) takes care of the hassles of home-maintenance. The HOA fee includes trash removal service, landscape maintenance, irrigation maintenance, common area lighting, building exterior maintenance, termite treatment bond, street and driveway repair, and clubhouse maintenance. Brookhaven of East Cobb also has a great social environment for active adults where they can participate in clubs and activities. From travel club, movie nights, book club, to fitness programs, active adults are sure to never have a shortage of activities to keep them busy all year long. Additionally, there is an activities director to oversee social and lifestyle activities at all of the Jim Chapman communities in the Atlanta area. Brookhaven of East Cobb is situated just off of I-575 north of Atlanta in prestigious East Cobb County. It is approximately 20 miles from Atlanta and 30 miles from Atlanta's Hartsfield-Jackson International Airport. Brookhaven of East Cobb is conveniently located nearby shopping like Town Center Mall, Wal-Mart, Publix, Lowes and Target. Other nearby attractions includes several parks, an aquatic center, three country clubs with golf courses, and Kennesaw State University, which provides lifelong learning opportunities. Medical facilities include Wellstar Kennesaw Medical Center and Wellstar Kennestone Hospital. Brookhaven of East Cobb in Kennesaw, GA has plenty to offer active adults from resort-like amenities to low-maintenance homes in a beautiful age-restricted community. 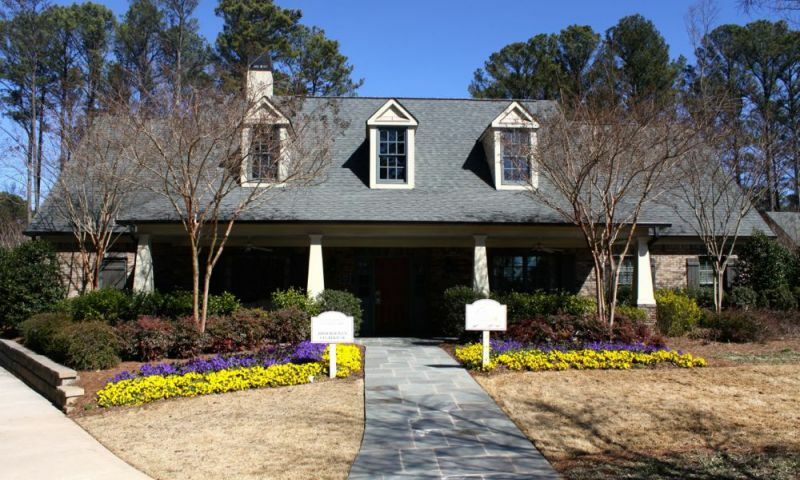 Brookhaven Clubhouse - 2,400 Sq. Ft. There are plenty of activities available in Brookhaven of East Cobb. Here is a sample of some of the clubs, activities and classes offered here. These attached ranch homes range in size from 1,626 to 2,375 square feet. These homes offer two or three bedrooms, two or three bathrooms, and an attached two-car garage. A finished or unfinished bonus room can be found upstairs as well as vaulted ceilings, sunrooms, covered patios or screened porches. Brookhaven of East Cobb has it all...great floor plans, outstanding features in the homes, and desirable East Cobb location. Our numerous clients in the community love it! All say it is a wonderful place to call home. We have enjoyed the entire process at Brookhaven of East Cobb. From site selection to construction completion and everything in between. The Chapman Property personnel and builders are fantastic. And this was not our first ever build from the ground up home. It was the easiest one. The knowledge of our 55plus realtors was a great asset to us during the process. Their experience was very helpful in suggesting changes other owners had made to their homes to make them unique. 55places.com is not affiliated with the developer(s) or homeowners association of Brookhaven of East Cobb. The information you submit is distributed to a 55places.com Partner Agent, who is a licensed real estate agent. The information regarding Brookhaven of East Cobb has not been verified or approved by the developer or homeowners association. Please verify all information prior to purchasing. 55places.com is not responsible for any errors regarding the information displayed on this website.